Here's a riddle: What suggestion does a wife give her husband after a series of cold winter nights? Got an idea. Well, in this case, it is probably not what you are thinking. In the late 70's, Chris Van Allsburg finished his schooling and was working as a sculptor. However, on cold winter nights his studio grew too cold for him to work. Therefore, he was stuck in the house and tried his hand at drawing. The type of drawing he was doing was new for him. He drew pictures of "people actually doing things". The only other drawings he had ever done before were for his sculpting work. His wife, a teacher, suggested that she take 5 or 6 of his drawings to a publisher because she thought they would be great illustrations for children's books. The publisher loved the drawings and presented manuscripts hoping Van Allsburg would illustrate them. However, he felt the stories were "uninteresting" and "unmoving". The illustrating idea was set aside by Van Allsburg for some time. Strangely, one day he observed a boy chasing a dog. This event rejuvenated his thoughts of storytelling and drawing. He describes that he started to "interrogate" himself about the boy and the dog. This interrogation led to Van Allsburg's book The Garden of Abdul Gasazi . This book was recognized with Caldecott Honor in 1980. Below is a video of Van Allsburg discussing his first book at Reading Rockets. My kids and I really enjoyed reading Chris Van Allsburg's books this week. He has written and illustrated 16 books of his own and illustrated three books for Mark Helprin . We were excited to find out that each book written by Van Allsburg has a common element; Fritz the dog. Fritz is the bull terrier from The Garden of Abdul Gasazi. The dog Van Allsburg modeled Fritz after actually belonged to his brother-in-law, and was named Winston. Unfortunately, after the writing of Jumanji, Winston died in an accident. Van Allsburg then decided to commemorate Fritz/Winston in each of his books. Sometimes he is easy to find and other times it is more difficult. Now my daughter opens a Van Allsburg book and says, "Dad, did you find the dog in this one yet?" I made up a worksheet to track your searches called, "Where's Fritz?" Please download and print it out! Chris Van Allsburg has been recognized with two Caldecott Medals. His second book, Jumanji won the award in 1982. The Polar Express , the beloved holiday classic, won the award in 1986. The interviews I have watched and the articles I have read gave me the impression that Van Allsburg is somewhat surprised by his success. He went from a sculptor that received very little recognition to being a beloved and highly praised children's author. He finds the positive feedback from the reviews of his books and letters from young readers highly motivating which drive him to write more books. Below is video discussing Van Allsburg's new book Queen of the Falls which is now available. His books have caught the attention of Hollywood in addition to the recognition from the children's literature community. Jumanji, its sequel Zathura , and The Polar Express have all been made into movies. My family enjoyed watching Jumanji and Zathura this week. The best part was that after watching the movies my kids wanted me to reread the books to them. I feel this shows that Van Allsburg's stories have a unique ability to excite children. His stories always have some element of mystery that spark children's imaginations. 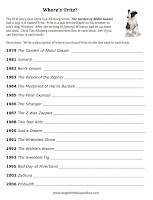 Lastly, I had a friend of mine write up his thoughts on the movies based on books by Chris Van Allsburg. Check it out! 4. Discussion Guides for Chris Van Allsburg Books - Houghton Mifflin (look for PDF or HTML Version) - Just about every book has a guide! 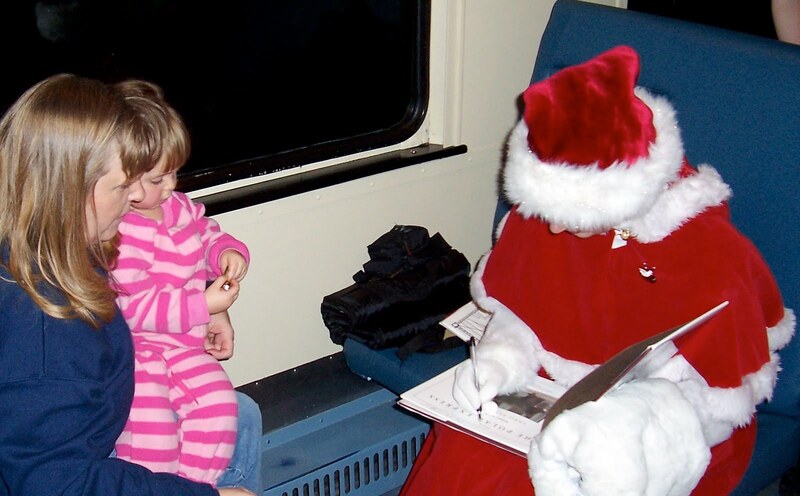 My daughter gets her The Polar Express book signed by Mrs. Claus while traveling on the Cuyahoga Valley Scenic Railroad with her grandparents. Check out an article in Trains Magazine about the holiday event. Saying Hey for Blogmania Support. Psss.... We also have an iPad giveaway going on right now till 7/2! We need nearly double the entries we have to get ours in for review. SO please take a minute if nothing else just to do the manatory entry. Thank you so so much.